Did you feel that? According to late Vedic priest Thomas Ashley-Farrand – a renowned guru who played an instrumental role in bringing the wisdom and gifts of Sanskrit chants to the West – mantras have a very specific effect on our mental, emotional, physical and spiritual states. Indian sages teach that these sound meditations can actually have the power to transform our human conditions, including relationships, health, happiness, career, finances and success, to name a few. The word “mantra” comes from two Sanskrit words: “Manas”, meaning mind, and “trai”, meaning to free from. In the literal sense then, mantra means to free from the mind. As sacred sounds, mantras were bestowed to sages often in meditations after they took on intense spiritual practices. The sounds were subsequently tested to examine the consistency and intensity of their effects, and then recorded in the Vedic scriptures to have an organized system of spiritual tools for transformation. But how can we in the West understand, appreciate, and most importantly, experience the positive effects of mantras? We know that sound is a physical vibration with palpable effects on our mind and body. For example, you can notice a difference in your mood when you hear heavy traffic versus classical music. The former can cause you to get irritated and tense up, while the latter can relax and soothe you. In addition to these measurable mental, emotional and physical responses, our subtle energy body also reacts to the vibration of sound. As sacred sound vibrations, mantras work on all of these levels and therefore can affect change at all levels. Each word or sound in a mantra has a very specific energetic effect. For example, chanting a mantra stimulates certain parts of the brain that release beneficial chemicals, which in turn elicit a more relaxed and peaceful state of consciousness. On an energetic level, our etheric or spiritual body, which includes our chakras and nadis (energy centres and channels) and aura also respond to the vibration of mantras. Seers state that they can actually observe the petals of the chakras (which look like lotus flowers) open and brighten up as someone chants a mantra. Each chakra has its own mantra which can be recited to increase its life force energy (known as prana or chi) and facilitate healing in its corresponding area. (Learn more about chakras in a previous article here). How does all this work to positively change our life situations, like increasing prosperity? Taking the example of prosperity, the “seed” sound of abundance is Shreem (seed sounds are words that are untranslatable because of their esoteric nature and yet are extremely powerful). Repeating Shreem can change not only one’s consciousness of abundance, but practiced enough over time, it can apparently change your karma (fate or destiny based on deeds from other lifetimes) related to prosperity. When you combine the mantra practice with a specific intention, like reciting Shreem to experience an abundance of career success, you further clarify and amplify the results. Although you can chant a mantra anytime and experience a certain degree of its effects, a 40 day practice of reciting a mantra 108 times each day (ideally morning and night) is recommended. In many religions and spiritual traditions, it takes 40 days to break an old mode of consciousness and experience a shift. And 108 corresponds to the number of nadis – channels through which spiritual energy flows and connects with the chakras. So, chanting a mantra 108 times for 40 days helps the essence of the sacred sound to become part of your consciousness on all levels. 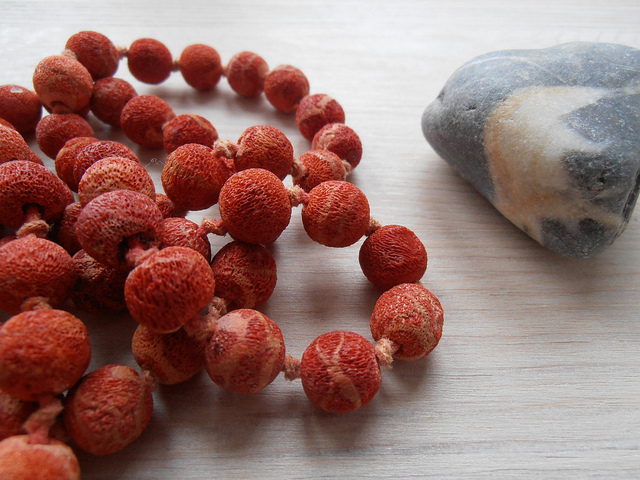 To help keep count, you can get a 108 bead mala (prayer/meditations beads) at spiritual stores or yoga and meditation studios. Write your intention for your chosen mantra on a piece of paper and refer to it often during your 40 day practice to connect with your goal. Set your alarm to remind you of your chant time, and maybe even create a special physical space where you can practice privately. 1. So Hum: The “I Am All That Is” mantra that connects your consciousness with Divine consciousness. Chant “So” on the in breath and “hum” on the out breath. 2. Ahem Prema: Meaning, “I am Divine Love”, chant this to experience your essential nature as a being of love and to become the very embodiment and emanation of pure love. 3. Shreem : The seed sound of abundance – repeat as much as possible to attract wealth and abundance. 4. Om Shanti Om: The mantra of peace – repeat to experience inner and outer peace and harmony. 5. Wahe Guru: Known as the mantra of ecstasy and widely practiced in Kundalini yoga – chanting this mantra elevates and uplifts the spirit. 6. Ra Ma Da Sa Sa Say So Hung: The eight sounds stimulate the life force energy within the central column of the spine to elicit healing. 7. Om Mani Padme Hum: The most beloved and widely practiced mantra in Buddhism, this powerful chant unites the mind and heart and brings about deep compassion for all. Practicing this mantra is also said to heal and uplift the state of the world. Developing a mantra practice is a wonderful way to connect with your spirit on a daily basis as it lets you take a much needed break from your daily busyness and re-center. And if the practice works as the Vedic gurus’ say, you might just enjoy some transformative inner and outer benefits as sweet fruits of your daily labour. Ahhhhhhhh…now doesn’t that sound just Divine? Namaste – The Divine within me honours and bows to the Divine within you. Originally posted on September 20, 2012 to Lioness Women’s club.